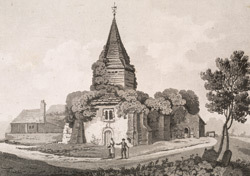 View of St Nicholas's church in Great Bookham, Surrey. This church has a long history and is mentioned in the Domesday Book. It survived under the patronage of Chertsey abbey, until the abbey was dissolved by Henry VIII in 1536. The upper part of the church tower is wooden and dates from the 15th century. It is an unusual and particularly striking feature for a Surrey church.